Do you know the island of Japan’s Sakurajima ? The Sakurajima is in the southernmost tip of Kyushu in Kagoshima , Japan . Kagoshima to appear in the history of Japan at the time of the Meiji Restoration . Named Satsuma clan at that time . Special products and history of Sakurajima . If there is a major eruption in the Taisho era , it became a land bridge . Sakurajima , an active volcano in the world. Distinctive appearance , such as protruding from the sea . Island itself is almost mountain . However , people also live . 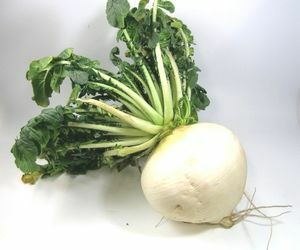 Specialty products Sakurajima radish . Hot spring is abundant because it is close to the volcano . Overlooking the sea ” Sakurajima magma hot spring ” . 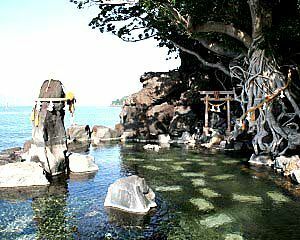 Scenery is great also ” Furusato Onsen ” . Sakurajima volcano originally submarine . It was on the island with a lot eruption . I have smoked all the time . 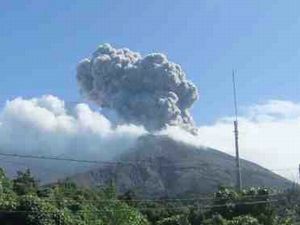 Eruption is increasing recently . Eruption of Sakurajima number of times in the 20 years of 2008 to 1988 about 3,600 times . The eruption of more than 1000 times in a year since 2010 . There was a big eruption in 1476 . Sakurajima came out to sea from the sea at that time . 1914 there was a major eruption in the recent past ( 1914 ) . 100m depth lava flows at that time . Buried a distance of 400 meters, which was between the land . Total amount of various things such as lava had erupted at that time about 3.2 billion tons . About 1,600 cups of Tokyo Dome . Eruption number became more Why ? The impact of the Great East Japan Earthquake that occurred in 2011 is expected . Magma chamber of Sakurajima , about 10km northern part directly under the Kagoshima Bay . To eruption to reach a limit to go this magma accumulated . This was stimulated by the earthquake . Volcanic activity is activated in Japan throughout .